I knew when I opened the shop that I wanted to have Monk Oil - I reach for it daily, it's the scent that gets me through the day - and I swear it makes me ready and AWAKE, it's the perfect morning - set me straight - kind of scent, plus it's added good vibrations... life just got better my friend! In the afternoon I put monk oil #2 on the back of my hands so that it's there for me to smell on demand. And call me crazy but I am dry hair girl and I have taken to putting it in my hair, yes you heard that right! Both Potions have a Rose Quartz crystal in the bottle to harmonize with unconditional love. 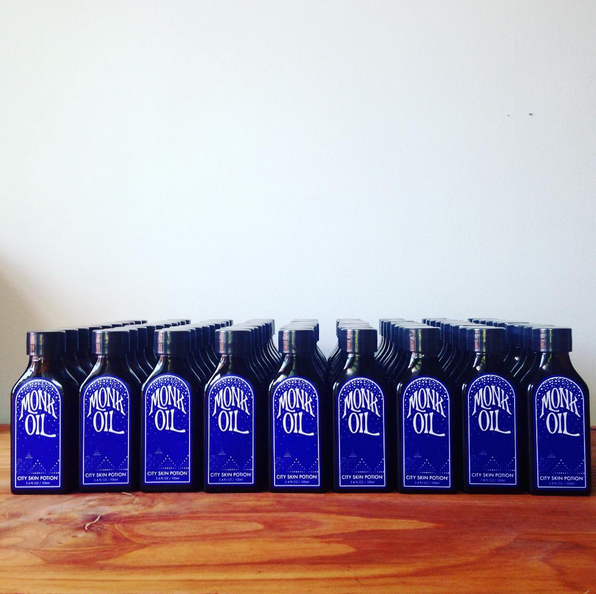 Monk oil is a earthy blend of oils that will ground you for the day. When Katie and Monika were on their annual camping trip to the Pacific Northwest they felt so close to the land. So much so that when they got back to their jobs at a honey factory in Brooklyn they realized they wanted that feeling of living on the earth - Terra Firma - to be with them even if they were in a busy metropolitan city. This was the beginning of Monk Oil. Is the original and much loved Monk Oil. Organic Avocado and Apricot Kernel Oils nourish, hydrate and soften all skin types. Essential oils of Cedar and Lavender simultaneously ground, soothe, focus and energize. Organic Rose Otto Essential Oil balances and uplifts, offering a sense of comfort and well-being. Yarrow Environmental Solution Flower Essence by FES protects against toxic environmental influences and other hazards of modern life. This includes the disruptive effects of electromagnetic fields and crowded places. Rose Quartz Crystals harmonize the potion with unconditional love. 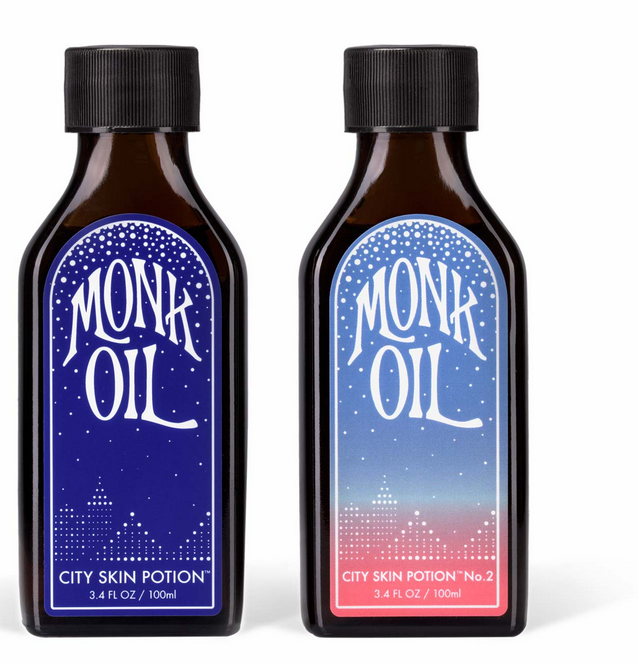 Monk Oil City Skin Potion is conjured in New York City on New Moons, Full Moons and other auspicious days. We created Monk Oil’s City Skin Potion #2 to be a scent as reassuring as a dear friend to accompany you throughout your day. A love poem to the California coast, it contains a triple rose formula of Rose Essential Oil, California Wild Rose Flower Essence and Rose Quartz Crystal. It is balanced with pure Sage Essential Oil to uplift and purify. Organic Avocado and Apricot Kernel Oils nourish, hydrate and soften all skin types. Together, these ingredients inspire us to embody the grace and resilience of a Rose. California Wild Rose Flower Essence is made by FES Flower Essence Solution and promotes a Love for the Earth and for human life, enthusiasm for doing and serving. Rose Quartz Crystals harmonize the potion with unconditional love. 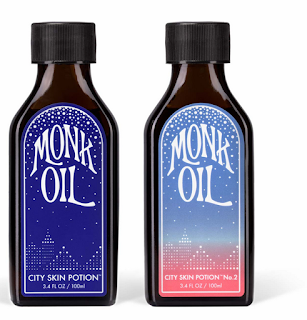 Monk Oil’s City Skin Potion #2 is conjured at dawn (for new beginnings!) on New Moons, Full Moons and other auspicious days. 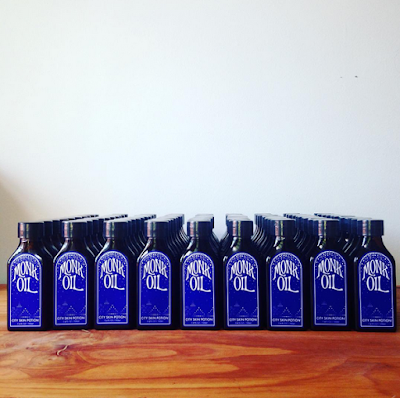 shop Monk Oil at Nonchalantmom here!